Camping can be a great way to get into the wild, take a break from our daily grind, and relax in the great outdoors with our friends and families. However, campsite cooking can be stressful, with limited camping food ideas, basic camping cooking gear, and the same old camping dinner ideas! 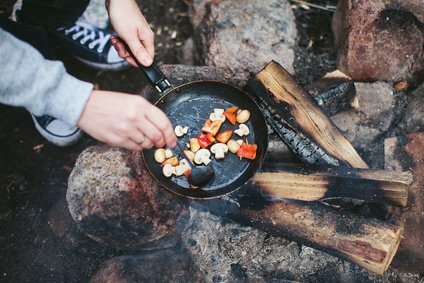 We’ll have a look at easy camping meals later on, and what food to bring camping, but for now, we’ve compiled a list of handy camp cooking tips to make your camping and dining experience stress free! Make a list of the meals you want to have, and measure ingredients and pack items specific to each meal. This can save a lot of time and hassle on your camping trip. Bring ziplock bags to separate ingredients and to keep dry ingredients dry and to stop wet ingredients from leaking. You could even create dry or wet marinades at home, and bring them in individual ziplock bags. Throw the meat or veg into your marinade mix, zip up the bag, and shake it for instant marinade! Chopping your food at home will save you time, and create less of a mess at your campsite. You can store them in those handy ziplock bags, and leave them in the cooler to keep your meat fresh and your vegetables crisp. If you do need to chop something at the campsite, make sure you have a clean and flat area to prepare the food. Taking sheets of baking paper and laying them on a flat surface will create an instant hygienic prepping area! Don’t bring that avocado slicer unless you really need it. If you end up taking everything but the kitchen sink, then your camping experience will be less about enjoying the wilderness, and more about being a fancy food chef! Keep it simple and pack less, which will save you space in your camper van, or your backpack. ​Make sure you lock container lids on properly while in transit, otherwise you might have a mess on your hands! You don’t want open food inviting animals, especially bears, into your campsite. Bring containers that you can close securely, and keep them out of reach, either high up in a tree, or in a locked vehicle. You also don’t want insects crawling into your food! Aluminium foil is a magical thing with many uses around a campfire. That silver foil can keep your food warm, store food for later consumption, and provide a method of cooking over a camp fire. Steaming some freshly caught fish is healthy, tasty, and one of the cleanest ways of cooking. You can even use a balled up bunch of aluminium foil to remove rust! Once you’ve planned your meals, and worked out what you need, bring your condiments, cooking oil, dressings etc. in squeeze bottles. This ensures you don’t need to pack the whole balsamic vinegar bottle, saving you space in your vehicle or camping backpack. You can even put the needed amount of dish washing liquid in one of these bottles, just make sure you label it properly! If you don't have squeeze bottles, you can use old water bottles, but make sure you don’t leave these bottles behind at the campsite once you’ve used them. While you’re enjoying your meal, boil some water over the campfire, to prepare for the washing up. Hot water will clean and sterilise cookware and utensils so that they’re ready for the next meal! ​Camping should be a stress free, relaxing time in the wild, and cooking outdoors on a camping trip can be difficult. Depending on how prepared you are, and following the tips listed above, might make your life easier, and you might even get your food quicker!